Mexican man awaits verdict in cocaine case - Patrick C. Fagan, Q.C. The fate of a Mexican man accused of being involved in the largest cocaine smuggling case in Alberta history is in the hands of a judge. Court of Queen’s Bench Justice Scott Brooker told court he will give his verdict on May 10, following final arguments Friday by Crown prosecutor Dan Misutka and defence lawyer Pat Fagan, who represents the accused. He must decide if the accused is guilty of being a party to importing and possession for the purpose of trafficking 60 kilograms of cocaine. 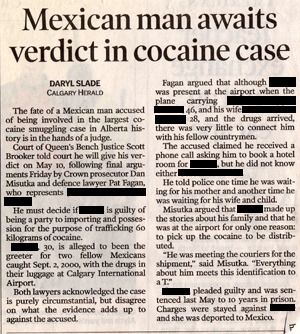 The accused, 30, is alleged to been the greeter for two fellow Mexicans caught Sept. 2, 2000, with the drugs in their luggage at Calgary International Airport. Both lawyers acknowledged the case is purely circumstantial, but disagree on what the evidence adds up to against the accused. Fagan argued that although the accused was present at the airport when the plane carrying Ricardo Rangel Corona, 46, and his wife Evelia Robles-Barreto, 28, and the drugs arrived, there was very little to connect him with his fellow countrymen. The accused claimed he received a phone call asking him to book a hotel room for Corona, but he did not know either Corona or Robles. He told police one time he was waiting for his mother and another time he was waiting for his wife and child. Misutka argued that the accused made up the stories about his family and that he was at the airport for only one reason: to pick up the cocaine to be distributed. Corona pleaded guilty and was sentenced last May to 10 years in prison. Charges were stayed against Robles and she was deported to Mexico.